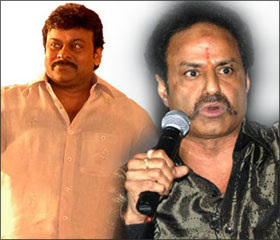 As Chiranjeevi's new political party "Praja Rajyam" is gaining popularity across the state, and as more politicians from other parties, especially from TDP are joining his party, Chandra Babu Naidu, the leader of TDP didn't have any other option than requesting his brother-in-law and the popular actor Balakrishna @ Balaiah to campaign for his party. At a time when TDP was facing some downturn, Baliah's active involvement into the politics, did bring some boost to the party men. Balakrishna was also instrumental in bringing in some independant MLA's into the party and moreover, retaining few leaders who were suspected to jump ships. According to the media reports, in a recent interview, our Baliah have told the media "If people wish to see me as Chief Minister, I will become Chief Minister"
AS you told, He is getting (Chiru) popularity , Thats one of the reason y Rajini fans are asking him to come to politics!!! lol....Chandra babu naidu karu then must be really shocked! anyway still the chair will be in the family alright?! Shyaam in Ungalil yaar adutha Prabu Deva!!! Why Endhiran was sold to the Sun Pictures?? ?